Now we are on top of summit: Marin, Jean-Luc, Dan. Jangbu, NaTenji. We can see Everest. Hope we will get down ok. Tricky. Be careful! Article from Himalayan times. Perched on the summit. Jangbu, Marin and Dan. On the final summit pyramid. Marin Minamiya Photo. Jean Luc Bremond summit of Manaslu. Annapurnas from summit of Manaslu. Marin Minamiya Photo. Climbers just below the summit pyramid. Marin Minamiya Photo. Dan Trevena and team descending from Camp 4 after succesful ascent. Marin Minamiya Photo. Na Tenji, Jangbu, Marin on Summit of Manaslu. Na Tenji climbs the ice step to camp 2 with a heavy Sherpa rucksack. Marin Minamiya Photo. Water break on the way to the summit. Marin Minamiya Photo. Dan Trevena on the ice step with other climbers below. Jean Luc Bremond Photo. Camp 3 - lower and upper. Jean Luc Bremond Photo. High winds blowing snow over the ridge across from Camp 3. Jean Luc Bremond Photo. Marin and Dan on the final pitch to the summit of Manaslu. All mountain below. Sunrise just below the summit. Marin Minamiya Photo. Team meeting just below camp 4, Marin and Dan Mazur congratulate Dan Trevena on his succesful ascent. Na Tenji Photo. 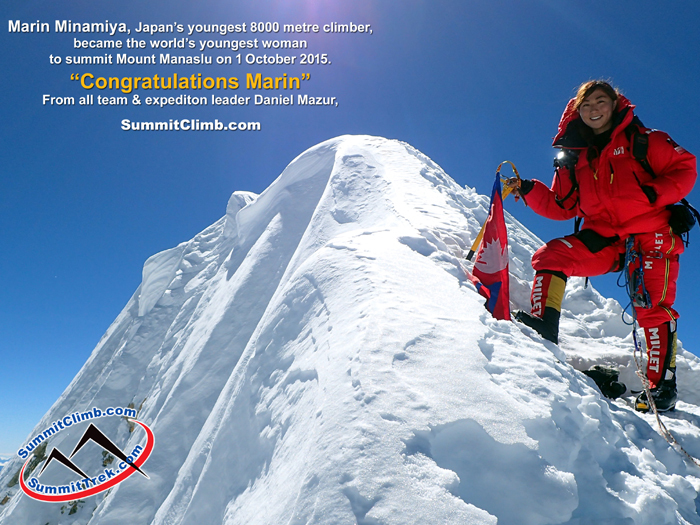 Marin on the Summit of Manaslu. Na Tenji Sherpa summit of Manaslu. Marin Minamiya Photo. Zoltan Benedek on the trail to the summit. Note the line of climbers over his shoulder. Jean Luc Bremond Photo. HIMALAYAN SNOW GIANT GREETINGS TO YOU AND ALL FRIENDS. How is your September? I am writing from snowy and sunny Mount Manaslu Base Camp at 4700 metres / 15,400 feet. Please scroll down to see nice photos and interesting blogs! Yesterday our team of men and women of all ages and abilities returned from the lovely and fun big glacier climbing above camp 2. We are down here in BC for a rest, where I am able to write to you on this fast satellite internet connection. 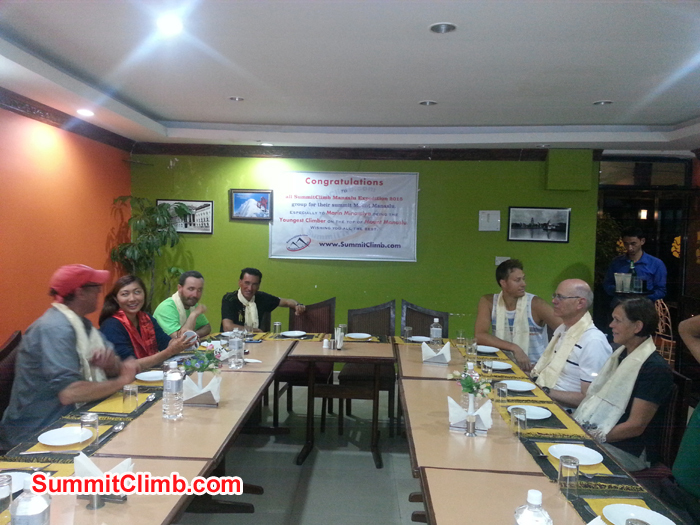 We are climbing the world's 8th highest and Nepal's easiest 8000 metre / 26,000 foot high peak. It's a gorgeous snowy Nepalese giant in the Annapurna region, with vast icefields perched above tiny villages in thick forests, surrounded by huge frozen giant mountains poking their heads out of cloud encrusted valleys with jungles, potato fields and yaks grazing on steep slopes far below. The weather has been very good, with lots of sunny days mixed in with a few snowy ones. The climbing action and scenery are incredible here. Please visit www.ManasluNews.com to laugh, love, and gasp at the beauty of the mountains (and thin air). By the way, Mount Manaslu, like Mount Cho Oyu and Mount Shishapangma are known as the best possible training peaks for Mount Everest !! Midnight now. We are in the tent filling water bottles, drinking hot tea. Clear starry skies. No wind. Come on team, let's go to the summit! We are @ C4. Route is very good, no crevasse. Met Dan, Vincent, Philippe, Santiago, Viktor, Boyan, 9 Sherpas. Congratulations. We go 2nite. Word just in. First group summited a few hours ago. Congratulations! Just awoke in Camp 3, first cup of tea. OK night @ 6800m / 22,300ft. Climbing up to C4 today. Try summit tonight. Our 2 trying summit now. Dan, Vincent, Marin and Na Tenji descending an ice wall. Photo Jangbu Sherpa. Dan Mazur climbing the icewall to camp 2. Marin Minamiya Photo. Dan descends a ladder while Vincent Callet belays while descending from Camp 2 to Camp 1 during a snow storm. Jangbu Sherpa Photo. Dan + Vincent climb C4. They try summit tonight. 4 members now in C3; going C4 in AM. 4 Sherpas return from C4: route perfect; no crevasses! Sherpas just radioed. They were able to fix rope across the big scary crevasse and have now reached C4 @ 7400m / 24000ft. Summit in sight! Marin climbing an ice wall on the way from Camp 1 to camp 2. Jangbu Sherpa Photo. Sherpas climbing steep slopes to camp 2, Manaslu North on right. Daniel Mazur Photo. In Camp 2 we have a wind and snow storm. Flapping nylon tents make sleep elusive. If its any consolation, this storm was in the forecast. We climbed to C2 in warm sunshine, along well packed snow paths, clipping good ropes across deep crevasses. Loyal Sherpas reset 2 ladders. Wakeup C1. Clear windless dawn over Tibetan border peaks. Clouds fill the valley below and Manaslu stands tall above. Let's climb to C2. Update from Expedition leader Dan Mazur: All team in Camp 1. Its a clear moonlit nite with no wind. Below us we can see a thick floor of clouds with just a few peak tops poking out. Large crevasse above C3. Need 2-3 ladders to bridge. Who will carry after 1st teams retreat to BC? High winds forecast for 27-28. Strategy! Update on Sherpa from other team fell in crevasse: Doctor exam - no broken bones - lucky! Now our team fixing rope. Weather forecast good! Rope fixers return BC. Apparently a Sherpa from other team fell in crevasse. More info tomorrow. Ropes not fixed to C4. High wind forecast. 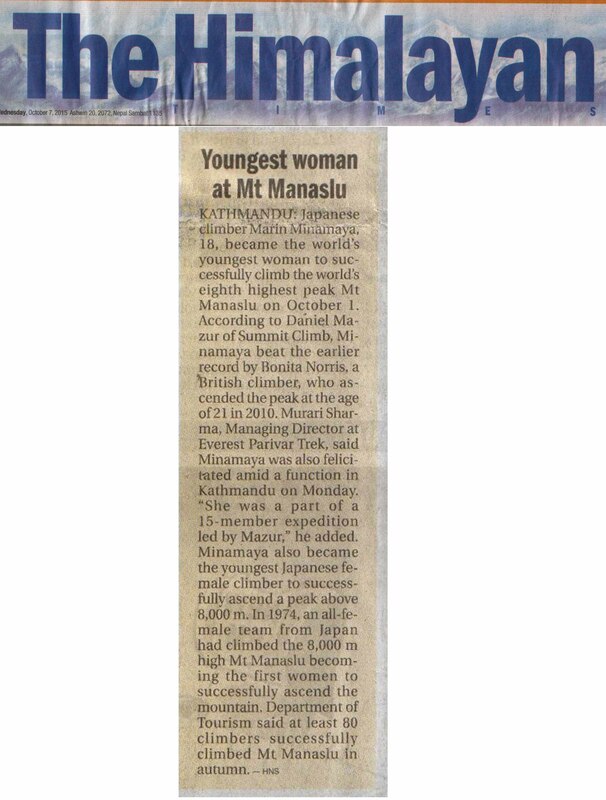 Dear Manaslu News Readers. Thanks for following the news of our expedition. Today is 20 September and I am writing from our lovely basecamp where we are enjoying a few restful days before attempting the summit. Our expedition climbing has been going well on the high mountain and we have come down for a break. We are just back from 4 days exploring the upper reaches of Manaslu, including Camp 1, Camp 2, and above. During our sojourn up there in the thin air we climbed through a lot of beautiful snow and gorgeous glaciers, and enjoyed some lovely camping experiences in the upper camps while acclimating. The weather changed several times while we were up there and fresh snow was abundant here and there. At opportune moments the sun generously popped out and consolidated the snow rapidly. This mountain is like a living and breathing organism pulsing with life and constantly changing with, sunshine, storms, clouds, snow and inspiring views of deep valleys and lofty Himalayan summits. How is life in basecamp? We have a very comfortable restaurant tent here with carpeting and a warm friendly environment. Inside are all of our chairs and tables over carpeting with our own skillful cook and table wait staff. The food is superb with lots of fresh local ingredients locally available from the villages below such as vegetables, salads, potatoes, pasta, rice, meats for the meat eaters, eggs, cheeses, even fresh breads! Each of us have our own personal sleeping tent with extra thick mattress and spacious dry, warm area to spread out our things. Each day we wake up in sunshine of our private tents with a wash in warm water and then enjoy morning coffee / tea / juice and a delicious breakfast. Following this, we might head for a warm shower with plenty of hot water or scan today's news on the internet. Then a delicious lunch with many types and flavours of food to choose from with a very wide selection of drinks. There are always many interesting sorts of people around to converse with and I think the entire basecamp might contain more than 12 expeditions, with members representing at least 30 different nationalities. When the mountains pop out of the clouds, we have really galvanising views and we can look around to see many local towering peaks such as Mount Larkya and Mount Ganesh, not to mention, mighty Mount Manaslu which looms directly above us so massively like an icon pointing straight up to heaven. In the afternoons and evenings, our more media savvy members often enjoy the large selection of dvds and movies on hand with plenty of new releases. We have our own dvd/movie player and it also has a nice sound system on which some of our members can enjoy playing music from their ipods and mp3 players. Everyone has brought books and magazines so there is plenty of sharing of reading material. Also, we have games like chess, cards, uno, and backgammon. Tournements are springing up. We are waiting for a good chance to go to the summit and hope that on the 23rd of September clear weather will ensue and we could set off for camps 1, 2, 3, and 4 and then attempt to reach the summit on 27 September. We all have our fingers crossed that Mount Manaslu will let us embrace her top. Team in C2. Snowing all day. Now night. Hope no avalanche will strike C2 tonight. Tomorrow: good weather go C3, bad weather go basecamp. We are @ C2 6400m / 21,000ft. 7-8 hour walk. Route in good shape. Strong ropes, ladders. Members, Sherpas fine. Warm, no wind, light cloud. Weather clears here in C1. We can contact C2. Six people are there; 2 want to come down and 4 to go up. If weather holds, we go up tonight. Update from Expedition leader Dan Mazur: Resting today. It snowed earlier, now stars are out. Weather forecast calls for heavy snow. Now very clear, quiet: hard to believe forecast. Update from Expedition leader Dan Mazur: Sunny rest day in Camp 1: 5750m / 18,860ft. Tonight @ 1am we attempt Camp 2: 6800m / 22,300ft. Route is steep glacier. Please wish us luck! Jean Luc Bremond climbing up to camp 2. Photo Zoltan Benedek. Jean Luc reaches camp 2. Self Photo. Zoltan Benedek climbing to Camp 2. Please note the climbers resting below on the left. Jean Luc Bremond Photo. Jason cooks delicious food in Camp 1. Marin Minamiya Photo. Jean Luc Bremond at 6,500 metres on Manaslu. Photo Zoltan Benedek. Jean Luc Bremond climbing up to camp 2. Photo Zoltan Benedek. Jean Luc Bremond in camp 1 preparing to go inside the tent. Photo Zoltan Benedek. Zoltan Benedek climbs the steep wall toward camp 2. Jean Luc Bremond Photo. Zoltan prepares for the departure from camp 1 at 5 am, headed for camp 2. Photo Jean Luc Bremond. Update from Expedition leader Dan Mazur: Began with BC ice training 2 new members. 6 of us are sleeping in Camp 1 tonight. Beautiful sunset across the Himalayan peaks and valleys! Update from Expedition leader Dan Mazur: Good weather. We're in 3 groups: two people rest Sama, 4 doing glacier training, two walking to camp 1. Our basecamp is a comfortable oasis. Our members are doing very well and 6 of 8 have been all of the way to basecamp at 4700m / 15,400ft. Basecamp is an amazing place, a tiny island of rock sandwiched between 2 massive ice glaciers; green slopes and waterfalls dropping away below into the abyss. Our two final members arrived this morning and we enjoyed hanging out together and walking around the village. Tomorrow we set off for basecamp. Let the climb begin!!! Update from Expedition leader Dan Mazur: Half of our team took a big sunny hike to Manaslu basecamp today. We reached 47OOm / 15,480ft, then returned back to Sama Village. Stunning! Trekking to Manaslu. Marin Minamiya Photo. Wild poppies in Samagaon Village. Marin Minamiya Photo. Update from Expedition leader Dan Mazur: Acclimatizing today. Visiting 400 year old temple. Trekking toward basecamp. 2 members reach KTM today: Daniel and Jacinta. Soon together! Beautiful blue wildflowers in Samagaon Village. Marin Minamiya Photo. Ceiling of the temple at Samagaon Village. Marin Minamiya Photo. Update from Expedition leader Dan Mazur: Manaslu team now stationed at 3500m / 11500ft in lovely green Samagaon valley. We flew here from KTM. All members ok, awaiting headache!